Vintage radios frequently suffer from noisy or faulty controls - especially the volume control, which is usually the most frequently used of all controls. 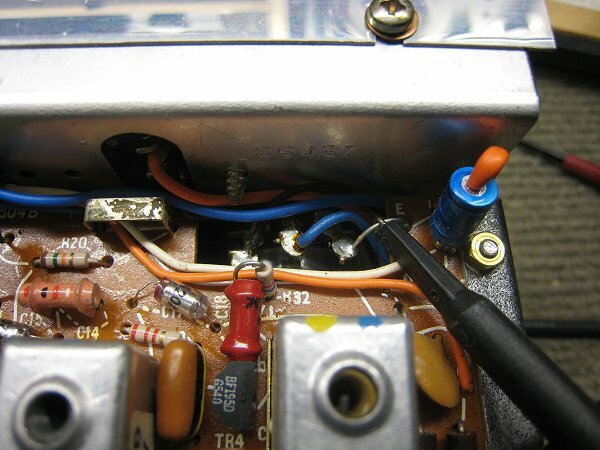 Of course, this is a problem for all vintage radios, and hopefully the information presented will be of interest to all collectors of vintage electronics, but this guide has been written specifically for Hacker radios. 1.1 Is there a DC problem? 1.2 Will it respond to switch cleaner? Before we get started, we must ask a basic question: why do we think the potentiometer needs replacing? Is there a DC problem? 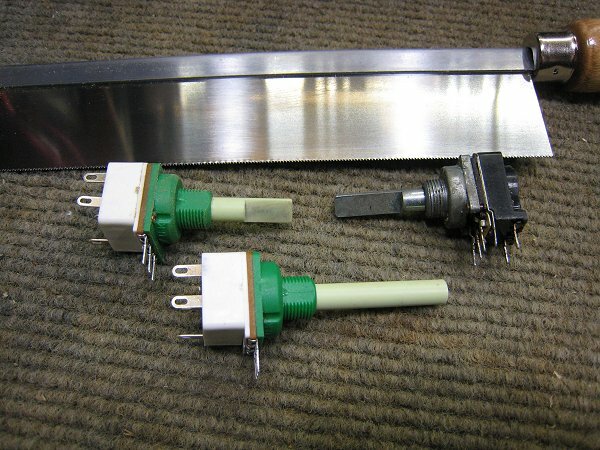 The primary enemy of potentiometers (and many switches) is DC. Most potentiometers will become noisy very quickly if there is a small DC current travelling through the wiper and on to the track. By "small", I mean less than a milliamp. Yes, I said "less than a milliamp". 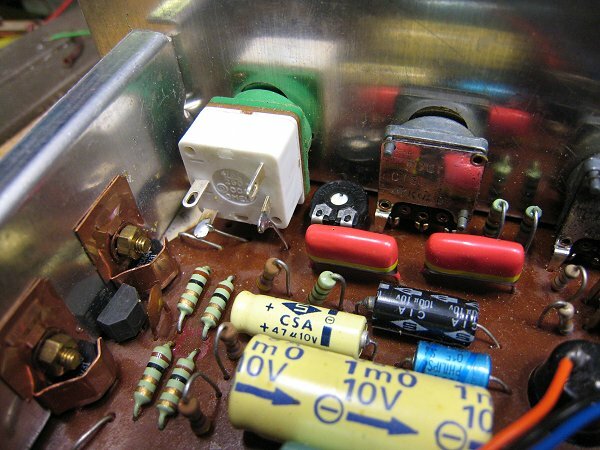 This effect might not be a big problem elsewhere - after all, people build DC power supplies for lab use, and these often have DC currents in the potentiometers - but in a radio, the signal levels at the volume control are very low indeed, so the following amplifier has a lot of gain following on from the potentiometer. Therefore, any noise generated in this component will be amplified very effectively. To put some numbers on this, let's take the A205 amplifier that is used in the Hacker Sovereign II RP25. The same amplifier is used in several other Hacker radios, and the other sets use very similar designs and voltage levels. For full output - 1.5 watts into 15Ω - the A205 requires an input signal of 36mV. That's an output voltage of around 4.7V RMS, so the A205 has a gain of 42dB. That's about 10-15dB more than might be encountered in a modern hi-fi system, where the signal levels are much higher. So, before replacing a potentiometer, we need to be sure that there are no DC currents finding their way via the wiper of the potentiometer. This means looking carefully at capacitors, and checking that there is no leakage. Beware of the following Hacker radios that have an electrolytic capacitor after the volume control! *: Note that this was changed to a 330nF non-electrolytic type in 1964, and if you come across a set that still has the electrolytic fitted, you should consider changing it. **: Note that this was changed to a 68nF non-electrolytic type, and if you come across a set that still has the electrolytic fitted, you should consider changing it. *: Note that this was changed to a 6µ8 in 1968 to reduce noise in the bass control. This capacitor should be checked and changed if the 40µF unit is found. **: The reference is unknown because as far as I know, there is no published service data for the SP80 - please contact me if you know different. My schematics were produced by reverse-engineering, but there are no silk-screen markings on the audio PCB. Fortunately, most of those sets use the usually-reliable Mullard axial capacitors - the types with the transulent light-blue sleeve. The main exception to that rule being the early RP18, etc, where the usual "Daly" types are guaranteed to be leaking heavily by now. But whatever the type, be sure that they are not leaking before changing the potentiometer! Will it respond to switch cleaner? Now this is really is a blindingly obvious question, and you're probably wondering why I didn't start with this. Well, I didn't because everyone else does. But they're wrong! Why? Simply because switch cleaner is wonderful stuff, but it will mask a DC problem. You'll finish up the job, and proudly put your newly restored set on the display shelf - or worse, send it back to the customer - and a within a few hours use the controls will be noisy. You need to eliminate the possibility of DC problems before using switch cleaner. Having said earlier that DC is the number 1 enemy of potentiometers, we can announce that oxidisation is number 2. Unfortunately, it is impossible to generalise about this - the extent to which the metal conducting surfaces will oxidise depends on how exposed they are, and what they are exposed to. And of course, what the base metal (and surface treatment) might be. Some potentiometers are fairly well sealed and seem to last well. Others seem to get noisy for fun. Some vintage radios have been stored in a perfect environment; others get left in a garden shed or a kitchen for most of their life. Some potentiometers and switches appear to have a deliberately finite life-span designed in - meaning that when they do become noisy, no amount of cleaning helps because the surface plating has been worn through and the base metal refuses to make reliable contact. The usual treatment is switch cleaner, or switch cleaner and lubricant. These are different, and it is important to ensure that some form of lubricant is left after the cleaning operation. The products generally come in an aerosol can that comes with an applicator tube, and you have to be careful to not use more than is required, as it can leave a nasty residue on the PCB. Some people prefer to buy switch cleaner in a bottle, and apply it with cotton buds or a hypodermic syringe. There are many different types of switch cleaner, and everyone will have their favourite. To be honest, it's hard to choose between them because you can't easily scientifically evaluate them - every situation will be different for the reasons outlined above. Personally, I use Electrolube EML - it's widely available and reasonably priced - a large can costs around a tenner and will last for a couple of years. It contains solvents and lubricant, and can also be used for mechanical problems like freeing up hardened grease. 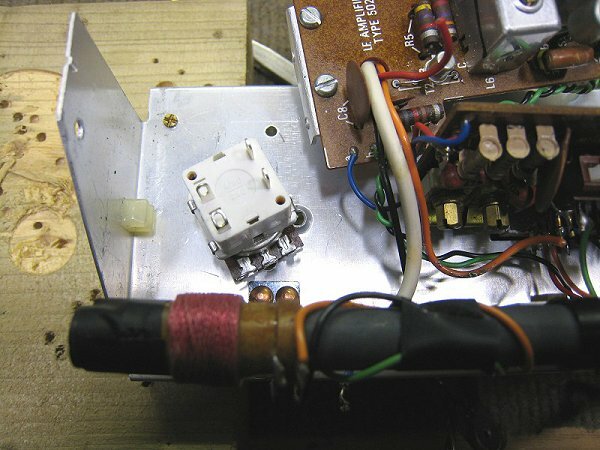 Almost without exception, Hacker radios require a potentiometer with a switch for the volume control. Values are either 4k7 or 47k - the former are usually found in AM-only sets, and the latter for AM/FM or FM-only types. 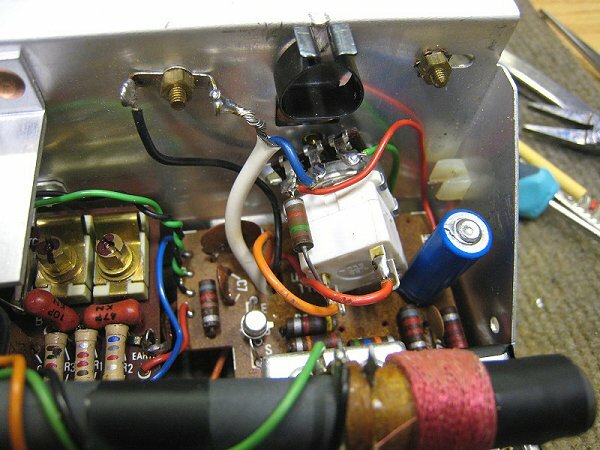 The valve Mayflower uses a 1MΩ switched potentiometer. The earlier sets tended to use chassis-mounted potentiometers of typically robust construction, whereas later sets used less dependable PCB-mount types. Naturally, as these are volume controls, they need to have a logarithmic track law. Is the exact value critical? Not really. In fact, the potentiometers fitted were usually 5k or 50k, and they had pretty wide tolerances - perhaps ±20%. In general, a replacement should be close to the original in value - and yes, 4k7 is close enough to 5k - but if you don't have the same, you can go up in value. So don't replace a 50k with a 4k7 (yes, I've seen that done! ), but you can use a 10k unit to replace a 5k original, or a 100k part to sucessfully replace a 50k. Don't take this too far though - should the following amplifier have a low input impedance, then the volume control will need to be turned further than it did before. Also, consider the preceeding stage - an AM stage might be relying on that 5k impedance for the correct operation of the AM detector or the AGC circuit. Be prepared to place a resistor in parallel with the track to test for this effect - test with crocodile clip leads first. The Hacker sets produced in the first half of Hacker's life will be considered first. Essentially, everything up to and including the Sovereign II should be covered here. The first option to mention is Blore Edwards. I haven't used them myself, having only recently discovered them, but I've read that they can build up potentiometers to pretty much any specification. They appear to be almost identical to the vintage Allen Bradley types that were so very common back in the 1970s. Prices are reportedly very good as well. Looking through the catalogues of the main electronics suppliers, I noticed the TE Connectivity 23 series. These are stocked by RS Components and Farnell, but Farnell only appear to stock the 47k version. RS appeared to have them, but upon entering the part number for the 47k log switched pot, the website told me that actually it's a 25k part. However, I didn't give up at this point - a quick look at the datasheet tells you that TE only supply 10, 22 and 47 values - in other words, it must be a mistake. Sadly, no-one at RS could actually go to the warehouse and look at one, so I ordered one speculatively and happily, it was indeed the correct 47K potentiometer. RS have now corrected the website. These prices are correct as of December 2014. Of course, you need to add VAT and handling to these prices. These aren't exactly the same as the original types - they are slightly smaller and, inevitably, the flat on the 1/4" shaft isn't in quite the same place. This means the pot needs to be rotated slightly in its mounting hole if you want the pointer on the volume control to line up correctly - which, take it from me, you definitely do. 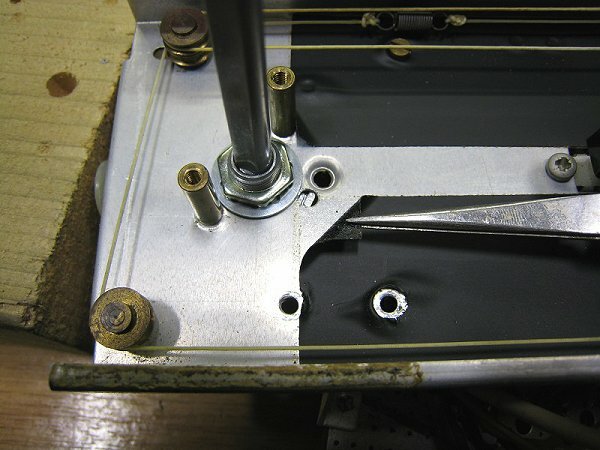 There are two approaches: break off the indexing "pip" and do the bolt up tight - hoping that it never works loose and rotates - or drill a new hole in the chassis. I suppose there might be an argument about originality, but personally, I feel that done well, the latter approach is preferable. You can see a thick washer which sat between the chassis and potentiometer - there was no need to transfer this to the new unit, but I did have to account for its thickness when deciding how long to cut the potentiometer shaft. Incidentally, I made my first cut with a hacksaw, but tried cutting the next one with sidecutters and this actually produced a much better result that needed much less cleaning up. But try that at your own risk! Here is the new potentiometer installed in the chassis. You can see the new hole that I had to drill in order to get the pointer on the volume knob to line up correctly. This can be done easily - I hold the potentiometer in place and check that I've rotated it to the correct location, and then press it firmly against the rear of the chassis, which leaves a small mark on the aluminium. If required, a pencil can be used to make a clearer indication. With the potentiometer removed, I can now see where I need to drill the hole. It needs to be 3.5mm. Incidentally, the original indexing hole has a depression pressed around it - not sure why, but this explains why the original potentiometer was installed with that thick washer. Also, the Democrat has one of the most complex dial cord arrangements for a simple AM-only set that I've ever seen! Here is the underside of the chassis, showing the new potentiometer sitting at a jaunty angle. As you can see, I have moved the IF PCB to one side to make access easier. Here's what it looks like when wired up. I had another set to hand for reference when doing this, but if you don't, take lots of pictures with a good digital camera (use Macro mode if you have it). I transferred the original 1k5 resistor from the original potentiometer (it's the HT dropper for the RF and IF stages). You might note that the AF117 has been replaced with an AF127 (by a previous repairer), and yes, that blue "Daly" capacitor was replaced before the job was wrapped up! I had to replace the black earth wire as the original was too short. 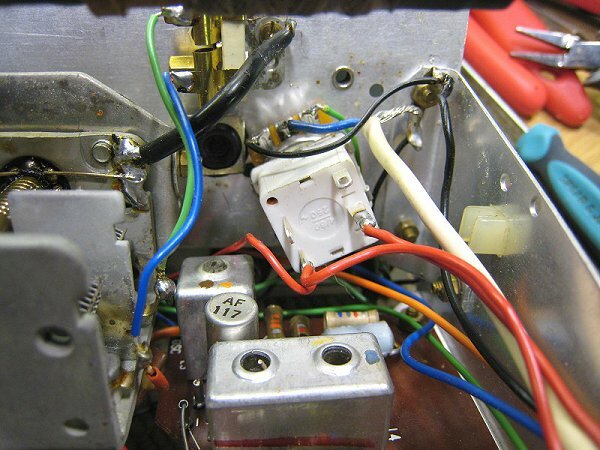 It's quite common to need to modify the wiring slightly - obviously do make sure it's done to the same standard as the originals; I've had to clean up some pretty horrible replacement jobs over the years - people don't seem to apply the required attention to detail. For example, I've never seen a replacement potentiometer that's been correctly rotated so the pointer lines up correctly - that's just lazy IMHO. 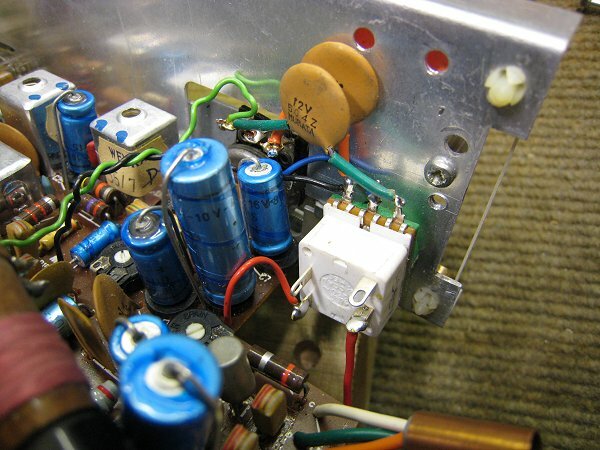 Note also the new capacitors; the decoupler on the PCB will almost always need replacing, and the smaller axial audio coupling capacitor needed replacing because the leads on the original weren't quite long enough to reach the tag of the rotated potentiometer. 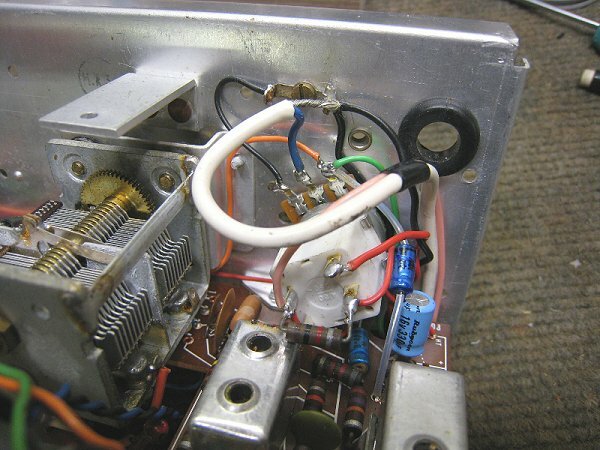 The green wire goes to the audio output socket, and the orange wire travels across to the tone control. These are reasonably straightforward jobs - I'll take a picture or two next time I do one. A different potentiometer is required for newer Hacker sets. I'm grateful to Ian Edwards - one of the team on the Hacker Radio Yahoo Group - for pointing these out. He covers them in a guide to replacing the volume control on the Super Sovereign - once you've signed up to the group, you can find it in the Files section. The potentiometer you need is different - it is made by Omeg, and is available from CPC (part number RE04422) for £1.75 plus VAT. This potentiometer has a 6mm shaft (instead of the ¼" shaft of the TE Connectivity type that the earlier sets need). There is no flat section on this one, which at least means you don't have to rotate the unit, but instead, you have to cut your own flat. As you might imagine, this is a bit fiddly, and you only get one chance to get it right! In practice, I've found that it's relatively easy. The secret - again, thanks to Ian for pointing this out in his guide - is use a razor saw to cut along the shaft. It's relatively soft plastic, and you only need to remove a small section of plastic to allow the knob to fit fully. I bought a razor saw from CPC - probably TL16618. This potentiometer fits the Sovereign III "family" - that is, the Sovereign III RP72, the Black Knight RP74, the Silver Knight RP76MB, and of course the Super-Sovereign RP75, as Ian's guide shows. Additionally, it fits the Sovereign IV RP77MB (and therefore the RPC1 radio/cassette recorder). 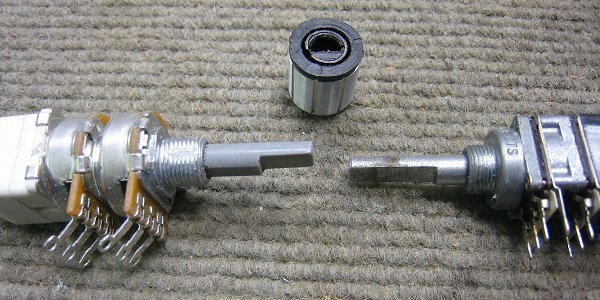 This picture shows the Omeg potentiometer as supplied, and another that has been prepared for fitting into the radio, alongside the original. The razor saw is also shown. 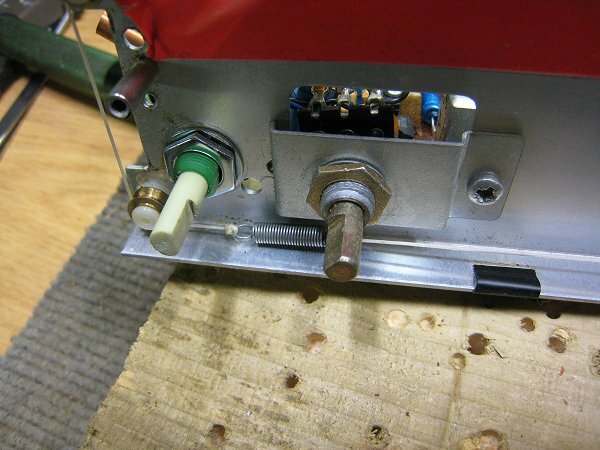 One word of caution: the razor saw produces very fine dust that seems to find its way into the bush of the potentiometer, meaning that the rotation doesn't feel as smooth as it did before making the cut. A bit of masking tape wrapped around the bush reliably prevents this problem. The new potentiometer fits nicely - the pins line up perfectly with the holes in the PCB for the track. Unfortunately the power switch is different, so short lengths of tinned copper wire provide the required connectivity. The non-switched versions can be used to replace the bass and treble potentiometers if required. The bass control is a 47k logarithmic unit, but unfortunately, the 4k7 treble control requires an anti-log track law, which won't easily be available (perhaps as an expensive special-order). In which case, I'd expect a linear control to work well enough - the treble control is set by ear after all - but there is always the option of using a higher value potentiometer with a "law-bending" resistor. This potentiometer also fits in the Autocrat Mk II RP73, and will very probably fit the Harrier RP71. Note that with this set, there is no index hole to stop the potentiometer body rotating. Indeed, there is no pin on the Omeg potentiometer anyway! So, make sure you tighten the nut properly, without damaging the relatively soft plastic thread. Sometimes, there is simply no suitable replacement available, and you have to think laterally to effect a solution. 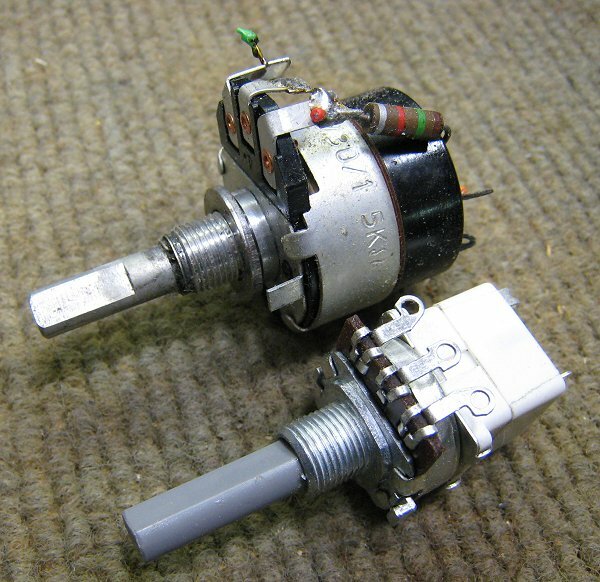 Luckily, you can sometimes dismantle potentiometers and combine parts from different models to achieve the combination required. This comparatively rare set is Hacker's only stereo portable, and being stereo, it obviously requires a dual-gang potentiometer. Unfortunately I couldn't source one that was switched, so had to make one. I bought a stereo potentiometer of the correct value (47k - Farnell part number 117-3988) and swapped the rear section from a switched mono potentiometer, transferring the switch to the dual potentiometer. Unbelievably, this terrible bodge worked perfectly! It's really just a case of folding up the tabs and carefully transferring the parts. Getting the alignment right before folding the tabs back down again is sometimes tricky, but if I managed it, anyone can! Unfortunately, the "flat" on the new potentiometer wasn't quite deep enough to accomodate the knob - this is a problem on all of the knobs used on their newer sets (Sovereign III and onwards). As noted earlier, if you're using the green Omeg pots, you have to create your own flat section with a razor saw or similar, as the shafts are completely round from new. But here, the existing "flat" needed to be filed down before the knob fitted. But luckily, it worked out OK in the end. It would have been so much easier if the correct parts were still available, but nothing I've done here prevents the fitting of the original components should they ever be found. Anyway, assuming you want to repair the original potentiometer, it is often possible to find replacement tracks from other units. For example, sometimes switches fail, but the track might be OK. Or, you might have found some NOS parts that don't have a switch, or perhaps the shaft is too short, or is the wrong type? 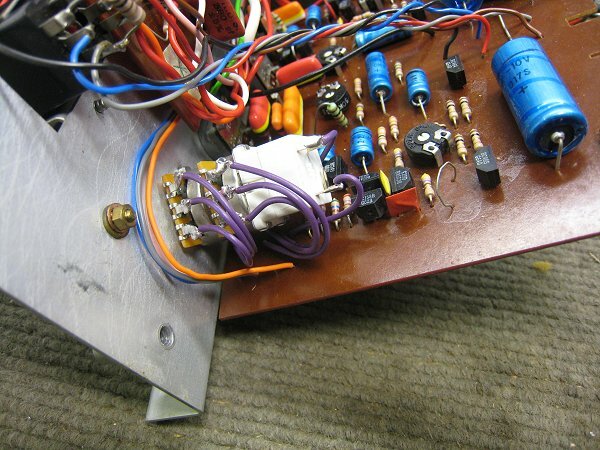 There were many variations on the same theme, but the basic body and track components were common across the range, which means it's very easy to swap parts between potentiometers. Next time I do this, I'll take pictures and post them here. At this point I'll mention Partridge Electronics, who stock an amazing range of obscure NOS parts at sensible prices. Don't be put off by the clunky website - I have used them several times, and it went well. Have a careful look at their potentiometer page, where you might be lucky enough to find the exact model you're after. But if you can't get a perfect match, you might well be able to get the parts you need to repair yours. Even if you're unable to swap parts from a known-good "donor" potentiometer, you might still be able to repair the one you have. If it's still noisy after repeated doses of switch-cleaner, then you might be able to take it apart and clean up the contacts. Obviously, be extremely careful with the carbon track - no abrasives on this! And pay attention to the wiper and also to the inner metal track, as there could be contact problems between these. Sometimes, bending the wiper springs slightly is a good plan, as it could put a bit more pressure on the contacts, or it could result in a different part of the track being used. When reassembling, it is essential to lubricate the moving parts. For the contacts, you need an electrical lubricant that will ensure good long-term reliability. Something like Electrolube EML might suffice. And don't forget the other areas - it is usually worth cleaning out the bush and renewing the grease so that the control has a nice "feel" when operated. Once reassembled, you'll want to test it. Most of the labour involved in a potentiometer swap is the wiring, especially if you make a decent job of it. So testing outside of the radio is recommened. To test the track, you need a powered loudspeaker. It needs to have a decently high sensitivity - more than a typical hi-fi amplifier has. Old PC speakers can sometimes be useful in a workshop, but again, these tend to lack sensitivity. Ideally, a dedicated powered 'speaker is required, like mine, which has a sensitivity of about 30mV - much like the original Hacker amplifiers do. And there's an idea - you could "re-purpose" an old Hacker radio that is beyond all other hope to use as a bench amp. Or perhaps use the "Gram" input on the Sovereign I or II that you use as a workshop radio? Anyway, after connecting up the amplifier (screen to one end of the track, input to the wiper), listen for crackling noises as you rotate the pot. In an ideal world, you do this test a few weeks after the repair, which gives a chance for the "honeymood period" of the switch-cleaner to wear off. Testing the switch is hopefully obvious, but do make sure it's tested extensively. Some switches develop intermittent operation. Sometimes you can wire both poles together in parallel to improve reliability, but that isn't always possible. We started by talking about the DC problem - a real problem that isn't discussed often enough in my opinion. Hopefully the details of the modern replacements will be of interest, and hopefully knowing that potentiometers can be taken apart and restored means that - like me - you'll start hoarding old potentiometers! Make sure you label up the faulty potentiometer, which is something that I didn't think to do at first! Just a simple label to indicate what the problem was - e.g. "noisy track" or "faulty switch" - is all it takes. If nothing else, I hope that the information here helps to keep a few more Hacker radios alive!